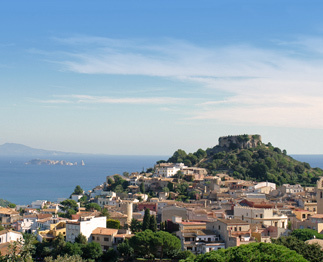 Begur is the Costa Brava’s most exclusive natural jewel. Concealed beaches, crystalline waters, abrupt cliffs and spectacular stone pine forests endow its whole coastline with great beauty and make it a unique place. History has left Begur with a legacy that can now be enjoyed while strolling through its streets and surroundings and that ranges from Palaeolithic and Neolithic sites, medieval fortifications and defence towers to splendid colonial-style mansions. Begur is a place that currently offers its inhabitants one of the best qualities of life available. It has excellent communications and is thus able to maintain the peace and quiet befitting an exclusive spot. Begur, which enjoys a pleasant Mediterranean climate, offers some of the country’s best cuisine, fine wines and cavas, an extensive range of culture, outdoor activities (water and mountain sports, cycle touring and hiking, horse-riding and quad trips, golf, etc.) and the festive atmosphere of a town that looks out onto the Mediterranean.